This large round bowl was made with hand pulled canes of bright colored glass, which is a two-stage time consuming process. First Dirwood hand pulled the canes used to make this bowl, then he made the bowl using those canes. 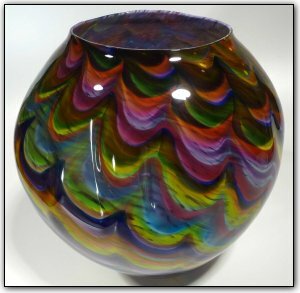 An optic mold was also used during the blowing process to create this one of a kind pattern. Make sure to zoom in to see the slight wavy-ness in form and how the physical shape interacts with the deep and vivid colors!